Iowa’s unemployment rate climbed to 4.4 percent in May, up from 4.3 percent in April. The national unemployment rate in May stood at 6.3 percent, unchanged from April. 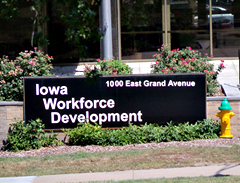 Koonce says Iowa’s nonfarm employment in May rose to an all-time high. “We’re at 1,548,700 (nonfarm) jobs and we grew by 6,200 over April. So, that’s very positive for Iowa’s economy,” Koonce says. The number of unemployed Iowans increased to 74,100 in May from 73,500 in April. The current estimate is 5,900 lower than the year ago. The number of Iowans who are employed, meanwhile, grew by 3,100 compared to April and 33,100 compared to May of 2013. One of the highlights of the IWD report is that the state’s manufacturing sector added 1,100 in May, marking the first monthly gain since December. “And our professional and business services, which is really a very wide category…that included temp jobs, added 1,300 jobs,” Koonce said. Since May of 2013, IWD reports the sectors which have posted the biggest job gains across the state are leisure and hospitality (+4,700), construction (+4,600), and trade and transportation (+4,500).